In an effort to keep my loyal readers from losing interests today I will reach into the storage bin for a bit of an historical piece. Back before I had unlimited free web hosting I was somewhat limited by the number and size of photos I could post online. One result was that many of my early photo sets were never uploaded in their entirety so as I clean up my archives I will occasionally re-process the photos and upload them. 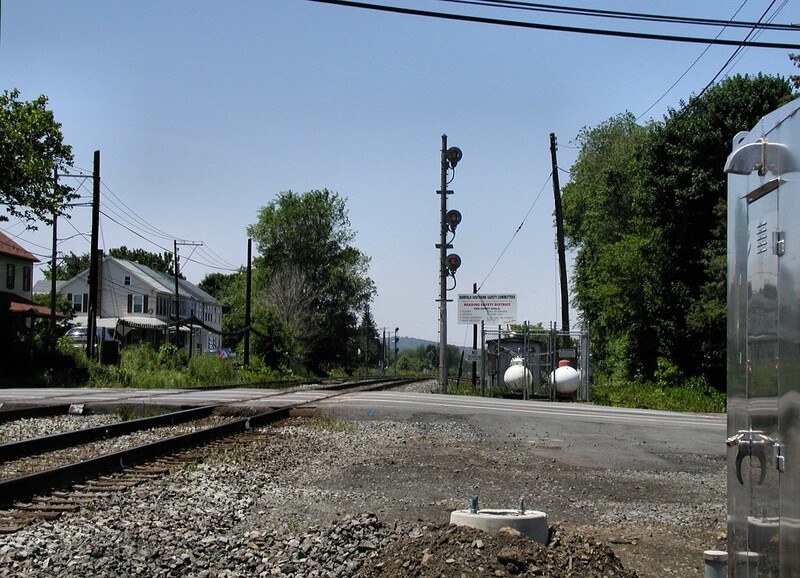 The latest result of this heritage project were some photos I took in 2002 of CP-ALBURTIS in Alburtis, PA. 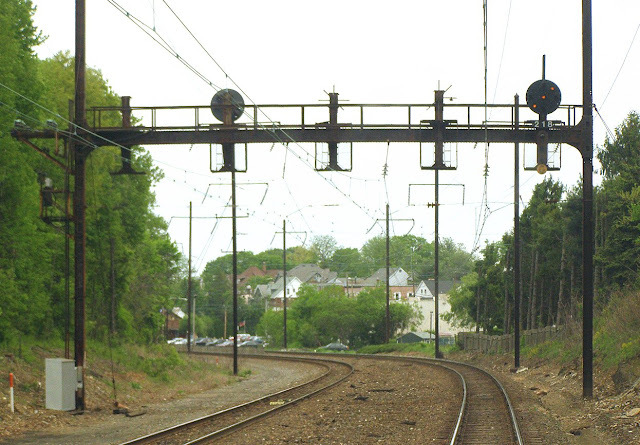 The interlocking is located on what is today the Norfolk Southern Reading Line, which was previously operated by Conrail and ultimately the Reading Company/ The line runs between the former industrial centers of Allentown, PA and Reading PA. The line is only about 30 miles long and the majority of double track line is still signaled as Rule 251, single direction ABS. 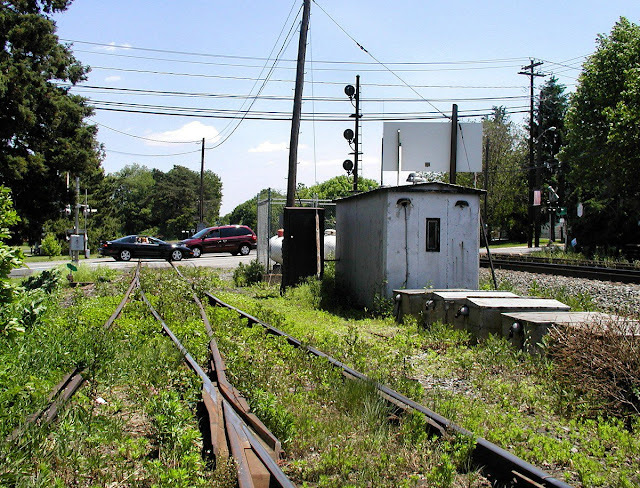 CP-ALBURTIS is both a basic crossover and junction with the C&F secondary, which used to run to a connection with the Lehigh Valley RR main line, but today just serves a number of local industries to a point a few miles short of where the LVRR main used to be. Back in Reading days I would assume that the junction would have been a typical ABS territory affair with no interlocking whatsoever and electrocally locked, hand operated crossovers and turnouts although it might have always had some sort of interlocking station. 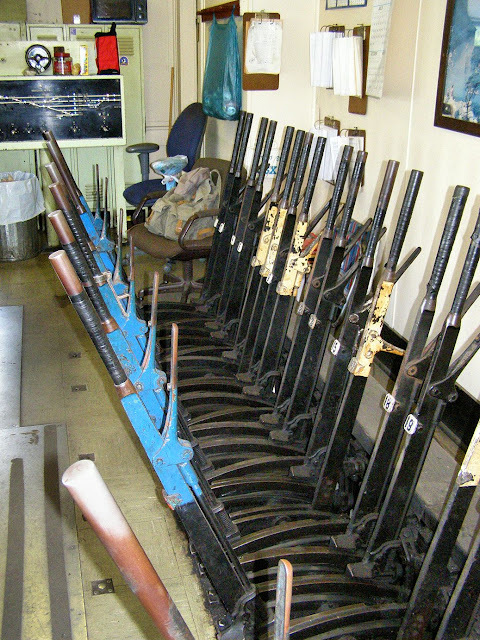 At some point in the late Reading period the interlocking was placed under remote control as the Reading was a pretty heavy user of CTC compared with riven PRR which continued to believe in manned block and interlocking stations. Anyway, at this point I am just going to dive into the photos. I'll start with the 2002 set and then show how things had changed by 2008. For reverence you can check out the 1997 Conrail Reading Line employee timetables here, specifically page 1. We begin by seeing the 346L eastbound home signal mast on #2 track. This signal was a Conrail replacement for whatever Reading era signals had been installed when the interlocking was put under remote control. These would have probably been target type color light signals with the round backing and triangular configuration. 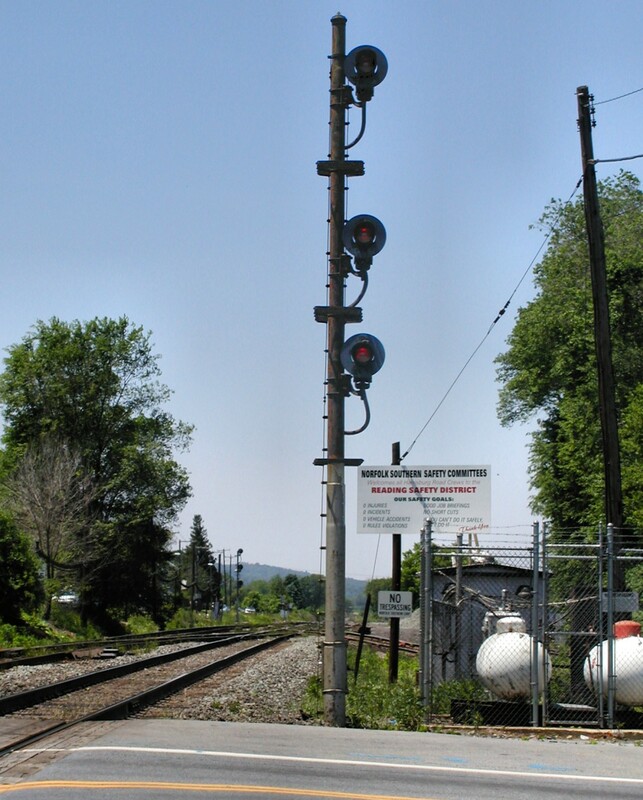 Back in the 1980's Conrail standardized on the Michigan Central style small target GRS model SA searchlight signal (before itself shifting to target type color lights) and this mast signal is an example of that. The 1980's date can be determined by the spiral corrugated steel foundation and non-solid base of the mast. According to the interlocking chart, this signal can also display R/Y/R Medium Approach for movements into the C&F branch as well as R/R/Y. That makes me assume there was an "End Auto Block" sign somewhere down the C&F. If you notice the signal was displaying a Clear aspect for an approaching train of roadrailers, which drop the signal to stop after it passes. Looking at the signal straight on we can see the improved light intensity as well as the small 344L reverse direction dwarf signals to the right of track #1. You can also get a hint that some changes are about to take place. Moving to the other end of the interlocking we find a first generation relay hut that indicates that the current interlocking was installed sometime during the Reading era. The concrete construction dates the hut from the time before the new pre-fab metal huts became commonplace in the 1970's. We also see on the 344R signal the same small target searchlights on an older type of mast with a solid base. As the Reading did not install these types of searchlight I have to assume they were a Conrail upgrade despite the rust, but the mast may be original as Conrail was known to re-use the existing Reading masts. Also of note is the Reading Safety District billboard, propane tanks for the point heaters and an electric power connection to the commercial grid. Observing the mast and relay hut head on we see that there is a grade crossing outside of interlocking limits on track #1, but inside the limits on track #2. 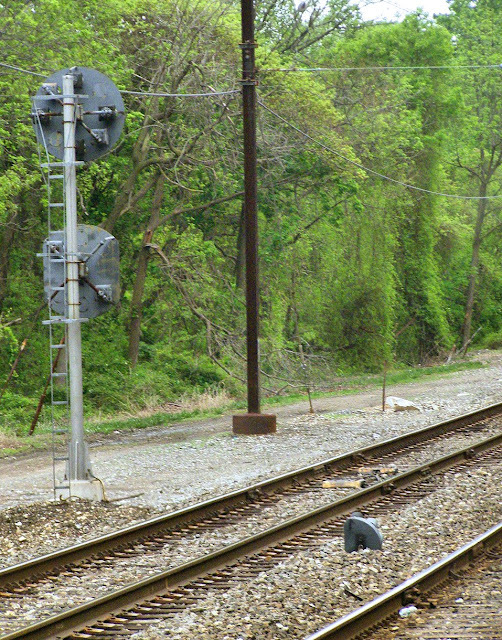 The reverse direction 346R dwarf signal (not pictured) was placed slightly east of the crossing to save on an extra insulated rail joint so when the train exits the interlocking it also ceases to occupy the crossing circuit. More evidence of upcoming change is in the foreground. Closer view of that westbound track #1 344R mast signal. The searchlights are not evenly spaced, but we can see that the targets are less rusty than the mast indicating they were Conrail era replacements. In this view the safety sign is legible. The C&F secondary track crosses the road just a few feet north of the Main Line. It is still protected by the same grade crossing gates. In this view we can see the shiny rails contrasting with the lush green carpet of weeds. The relay hut is sandwiched between the C&F and the main tracks and behind the relay hut is a slew of battery cases which probably served as backup to the mains power. Movements off the C&F were governed by the 342R twin stack SA dwarf signal backed up by an adorable little shrubbery. The double stack signal allowed for G/R and Y/R slow speed aspects as well as a R/Y Restricting aspect. Before I begin again I would like to remind everyone that you can and should follow along on the track charts on blockstation.net. You can also view the entire set of these photos here. If you are lost after viewing Part 1, please refer back to the post covering PAOLI interlocking, where our train crossed over from track 4 to track 1, to run against the flow of traffic. We resume at the 218 intermediate signal where the Track 1 signal is displaying Approach for the stop at PAOLI's home signal, but it also has the lower Approach Medium | for diverging movements. Because all trains make a PAOLI station stop and diverge at the east end of the interlocking, Approach Medium is rarely displayed on the 218 auto. You can also see the various disused signal configurations that litter the gantry. As built there were 2 signals in each direction. Then track 3 was removed and track 4 moved into its position on the RoW. Track 2 was then made bi-directional which installed a new signal on the beam. Finally track 2 was removed and both its signals were also removed leaving two active signals and 3 inactive signal mountings. Note the (G) board and the Malvern station in the background. That is the final stop for most local commuter trains at 21.6 miles from downtown. Next up is FRAZER interlocking. Like everything else it went in during the 1994 relocation of the Paoli yard and shop complex. Instead of rebuilding the #2 track out to the new yard they simply installed a trailing point crossover and pocket track for trains pulling out of the yard. Good news was it got all amber PLs. Here we have the 8E signal with a bulb out governing movements out of the pocket track. The 4W on the main and 8W pot at the end of the pocket. The 4W can give a Slow Approach for trains entering the yard as there is a fixed Restricting signal at the end of the interlocking. Without the fixed signal trains would have to get a Restricting on the 4W which would slow things down. Trains approaching the 4W at Slow Approach get straight Approach instead of Approach Slow on the distant. The 1E signal as a commuter train pulls into the pocket track from the yard. Note the vertical | lower head with only a single marker light on the 1E. Also note the hotbox detector. That reads out in PAOLI tower. Full view of the interlocking showing the 4E pot signal and an HBD-DED on track 1 which reads out in THORN tower. Next interlocking is GLEN. This is remote from THORN as installed in the 1937 CTC project. 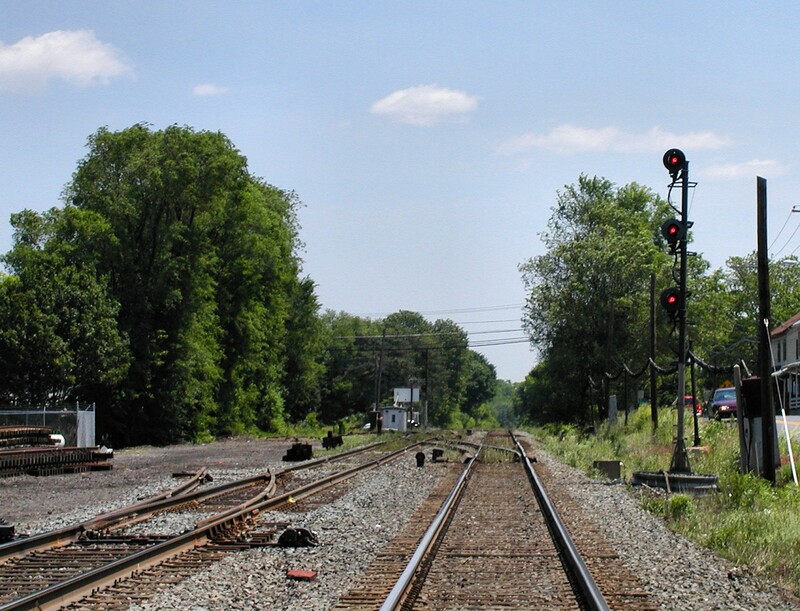 GLEN was the flying junction between the Trenton Cutoff goods branch with the Main Line. When built the ML was 4 tracks and the cutoff 2. Today the Cutoff is just an unsignaled secondary track. The ML is two tracks, but here 2 track re-appears from the wet lead to the Frazer Yard. The interlocking is on tracks 1 and 2 only and consists of 2 switches sllowing the Dale secondary track to access either track 1 or 2. Track 2 is bi-directional and not used much, but much slower than track 1 so the Operator at THORN has some discretion on how to route trains. Here we see the 100R and 102R signals along with the 99 switch. Lever numbers correspond to the THORN CTC machine. Wider view showing the 99 switch. 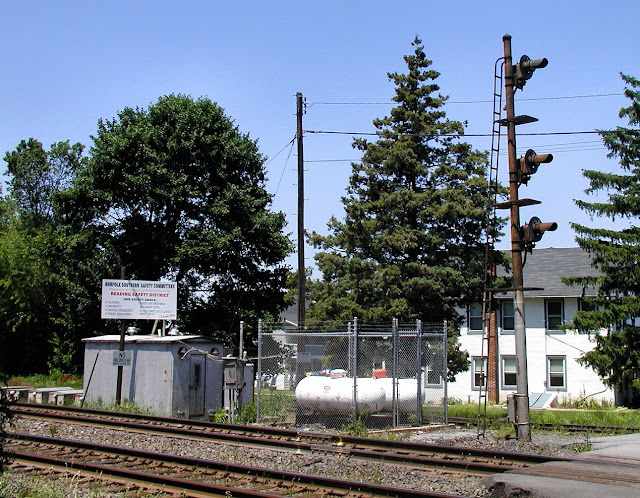 This post originally appeared on another signaling related forum in 2008 and contains photos taken in the summer of 2007. I should mention that the format of this post relies more on in-text links to photos than embedded photos so that means it will load faster, but you will also have to click a lot more. I don't have the time to re-write the post so you can all use this as a point of comparison between the two styles. Anyway, 2007 was a rough year for mechanical interlocking towers in the United States with two of the 4 remaining towers with mechanically operated switches being closed. HANCOCK (featured here) closed in September and GRASSELLI Tower (2 mechanical switches and open part time) closed in November. This left RIDGLEY in Springfield, IL (1 switch) and Z tower in Keyser, WV with many switches as the only two active towers with lever operated points in all of North America. Z tower later closed in 2008 and Ridgley followed in 2010 which left no mechanically worked points in North America. Hancock (or HO) tower was one of a string of towers along the former B&O main line between Washington and Pittsburgh, now operated by CSX. 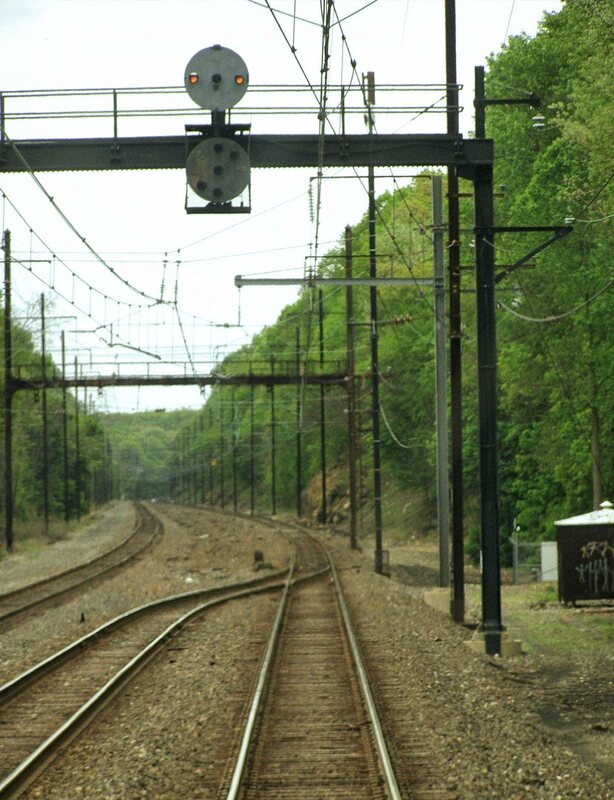 For the longest time CSX had been rather opposed to capital investment and as the year 2000 approached this ~300 mile segment of main line was still mostly single directional and hosted 7 active towers along its route, 3 being purely mechanical. 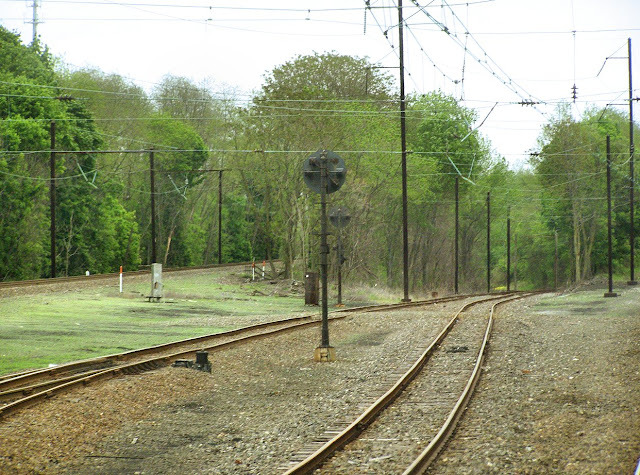 In fact the segment up the Sand Patch grade between Cumbermand, MD and Connelsville, PA had the last operating Morse code telegraph line in the country, in use until about 1986. 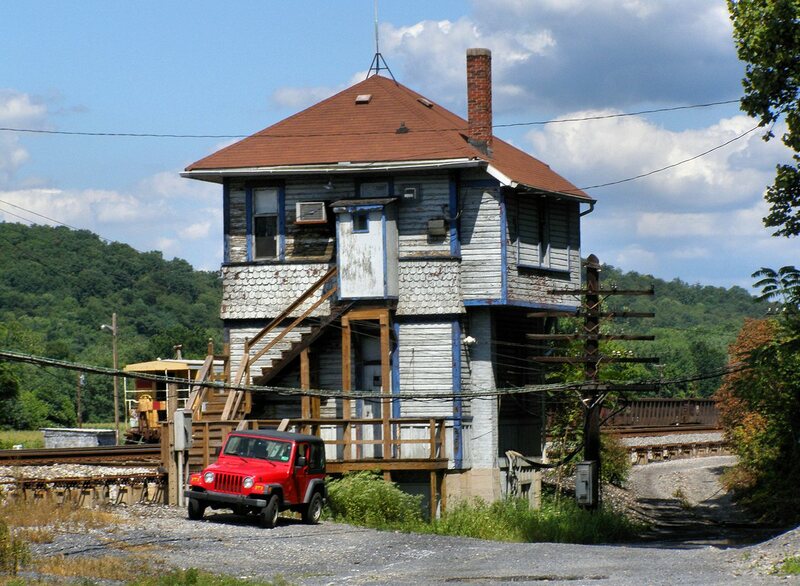 The towers from east to west were WB (US&S Model 14, pneumatic plant with relay machines for remote interlockings), NA Cabin in Martinsburg, WV (GRS panel relay machines), W tower at West Cumbo (GRS Model 2 pistol grip), R Tower at Miller, WV (mechanical), HO tower at Hancock, WV (mechanical), Hyndman tower (mechanical, simple crossover), SA Tower at Sand Patch, PA (GRS Model 2 pistol Grip) and VI Tower at Connelsville (Relay CTC machine in yard office). Today only WB remains open, VI having closed in 2009. 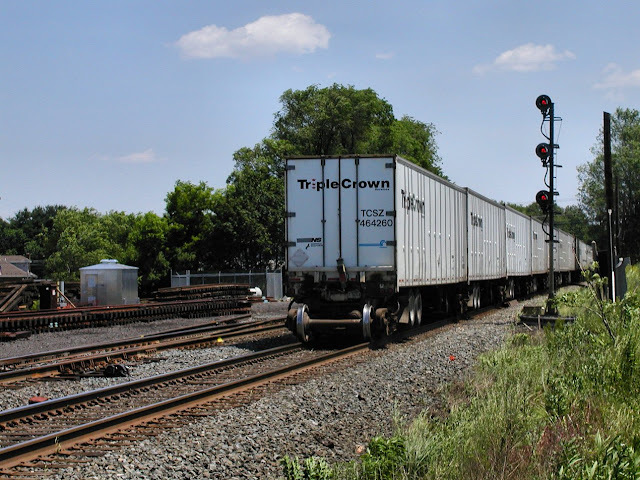 R, NA, W, Hyndman and SA were closed between 2000 and 2003 in a general line upgrade to meet with increased traffic as a result of the Conrail merger. CSX has and continues to be the worst performer in terms of end-end intermodel trains with a fleet wide average speed of 22mph!! The single direction operation on much of the route was proving to be a huge bottleneck and most of the signaling dated from the 20's and was about ready to crumble into a pile of rust so it was a miracle that all of these towers survived this long. I am not sure when HO tower was built (I am not yet a B&O guru), but it was probably on or before the 1920's probably when the line was triple tracked. It was built at the same time as its sister, R tower, just a few miles down the line. HO was of all wood construction with a band of fish scale siding. Hancock's lever frame never supported mechanical signal levers, signals being handled by some sort of subsidiary panel much in the same fashion as a US&S Style S electro-mechanical machine. HO was treated to some sort of mid-life renovation as the current model board clearly dates from the 40's or 50's, asbestos floor tiles were installed and the second story relay room was either added or expanded. Hancock might look large from the outside, but the operator's space is actually quite cramped as the rear 2/3rds the space of the top floor is occupied by the relay room. HO survived due to a strange combination of luck and circumstance. 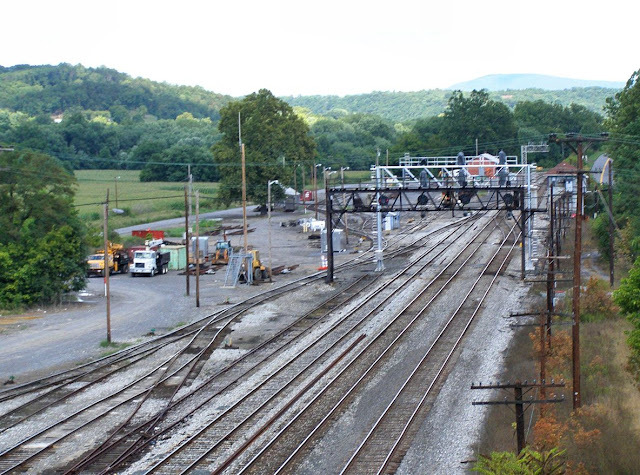 The segment between R Tower and Cumberland, MD (see my recent post on B&O signals) had been equipped with CTC sometime back in the 50's or 60's when the 3-track route had been condensed to 2. Hancock also looked over a small yard with a weigh scale for sand trains coming out of a nearby quarry. As HANCOCK interlocking itself was not presenting a capacity bottleneck, there was no need to spend the time / money to replace it when so many other projects were of higher priority. 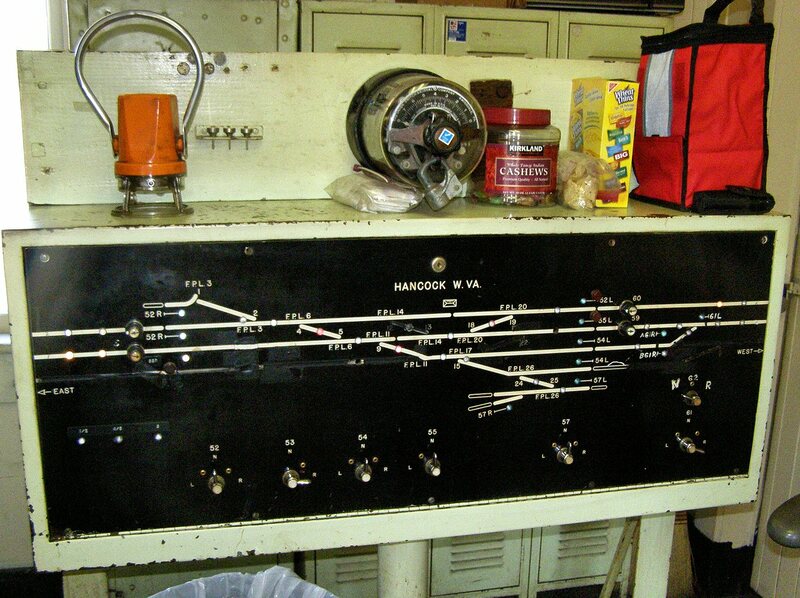 Still, when the line east of Hancock was re-signaled when R Tower closed the east end of the interlocking was converted to electric switch machines with colour light signals. Switch levers 1, 2, 3, 4 and 9 were connected to the electric machines and the parallel crossover operated by the 12 and 13 levers was removed. Anyway, HANCOCK's luck ran out as the date of Sept 17th, 2007 was set for its closing. Over the summer C&S crews began to install the new equipment, including a new 3-track signal gantry, to replace the old 4-track B&O signal bridge, cutting one of the yard access tracks in the process. Word came through the railfan grapevine that one of the operator's at HANCOCK was cool with letting railfans in for photos of the soon to be closed towers and needless to say I was able to take advantage of the situation. You are in for a real treat as I am able to present an unrestricted set of photos from my trip to and tour of HANCOCK tower. You can find the new photos in this gallery and you can also keep reading for a rather more complete illustrated technical description of the tower. 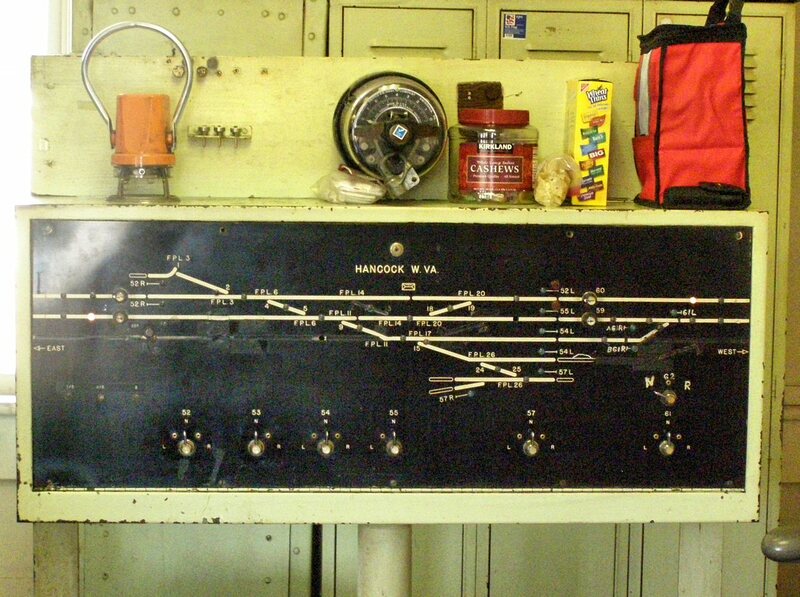 The model board also had the signal "levers" (toggle switches) on it. While the board appears to be of the General Railway Signal design, but labeld in the Union Switch and Signal fashion with the L and R terminology for signals. The 52 lever is for 2tk, the 53 for 1tk west, 55 for 1tk east, 54 for the controlled siding east and 57 for the yard tracks. 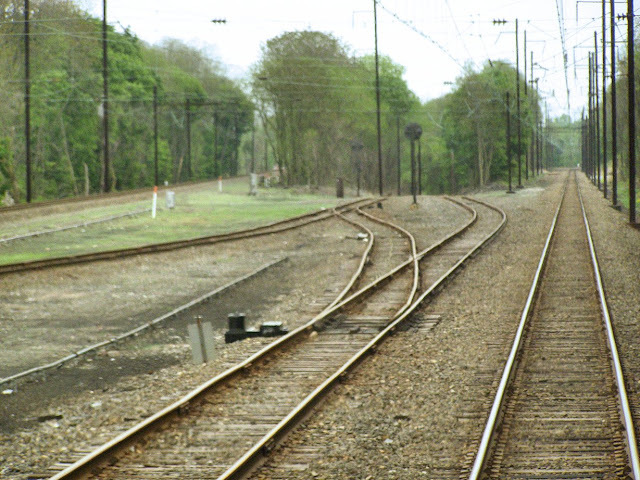 The reason for splitting 1tk between two levers has to do with the original configuration when what is now 1tk was a bi-directional center track and something with the bi-directional circuitry required a separate lever. Also visible on the model board is the remote interlocking GRASSHOPPERR HOLLOW. This was another late addition when the line was two-tracked and the old third track was truncated into a controlled siding. The 61 lever for the signals and 62 lever for the switch was installed on the model board. Above the model board is the interlocking's only release timer. The timer is a whopping 8 minutes long(!) (on lines like these time timers are typically between 4 and 5 minutes) and it applies to every signal in the interlocking, even the yard dwarfs(!!) (which are typically only 2 minutes long). Making matters worse there is no approach locking, so any displayed signal must either be knocked down by a train or suffer the 8 minute timer penalty. This makes it virtually impossible for the operator to play around, displaying signals for the fun of it or for photo ops. 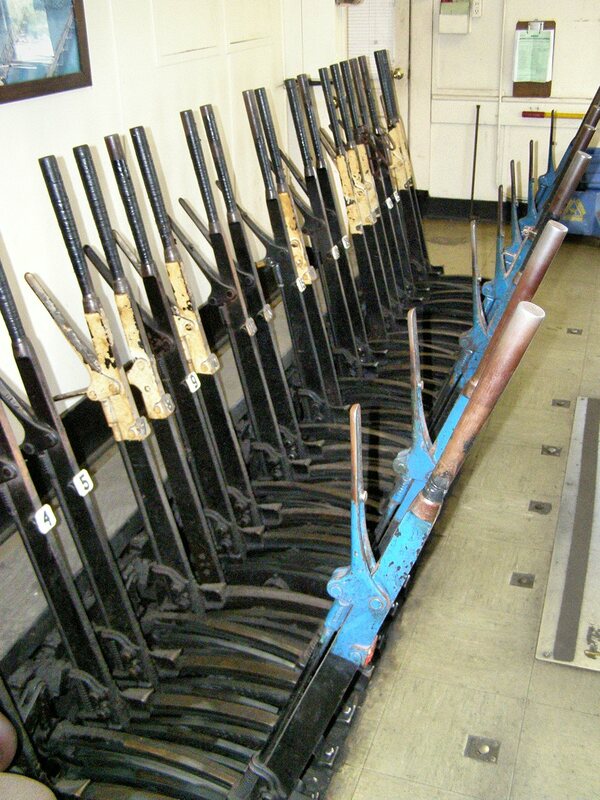 The Hancock lever frame followed standard conventions with black levers for switches, blue for facing point locks and white overpainted for spare. SOP called for the lock levers to remain in the locked position until a switch needed to be moved. Because every switch could encounter a facing point train movement every switch and turnout needed its own FPL. The blocking devices consisted of a small metal wedge attacked to a ring. 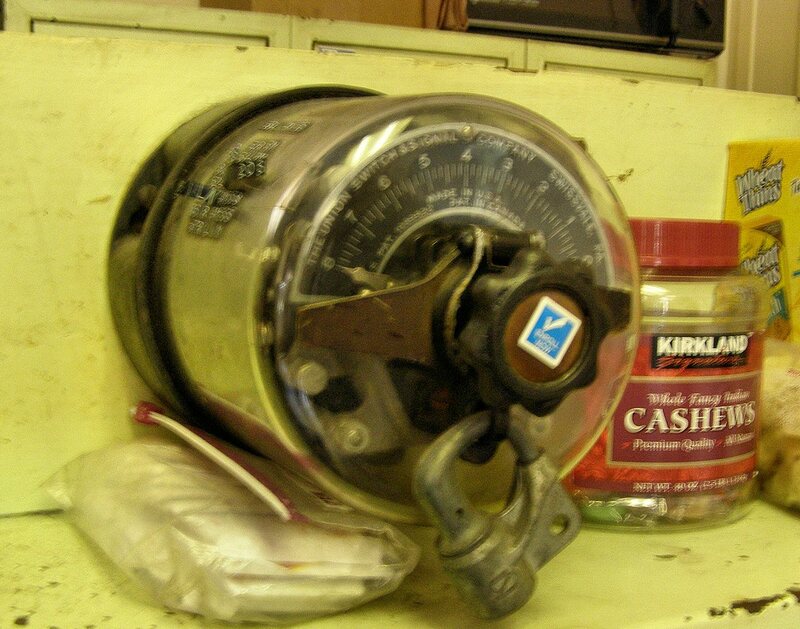 The rin would fit around the lever handle and the wedge would prevent the locking lever from being depressed. 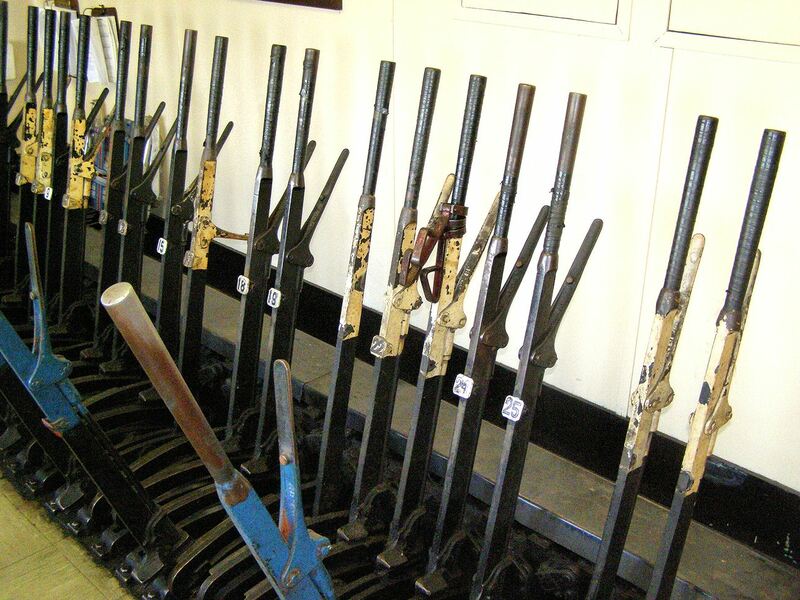 The 14 FPL lever was the only one fitted with a blocking device. The 14 locks the now non-existent 12/13 turnout so the fact that it would never need to be unlocked might prompt the operators to block it up least they break some part of the interlocking's workings. As these old interlocking age sometimes the infrequently used appliances can wear down in such a way that operating them can seize up all or part of the interlocking plant. Operators sometimes calls these "booby levers" and learning which actions can break down the plant is a key part of the tower qualification process. Here is the model board without a route lined up. 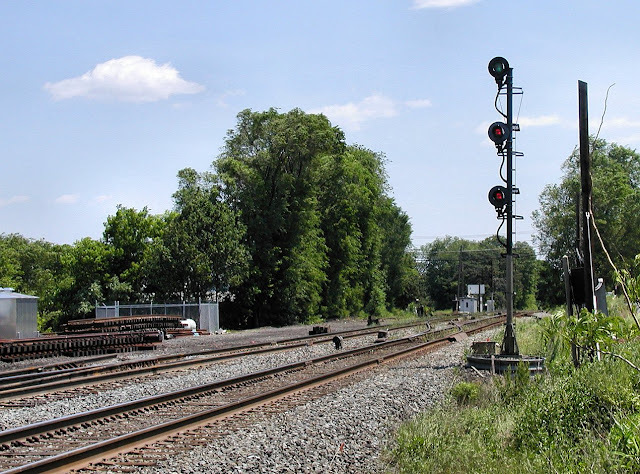 Each main track has two approach lights. The inner one indicates that the flow of traffic is set from that direction. The outer one means that a train is approaching. Trains "tap on" when they are about 3-4 blocks away and arrive about 8 minutes later. 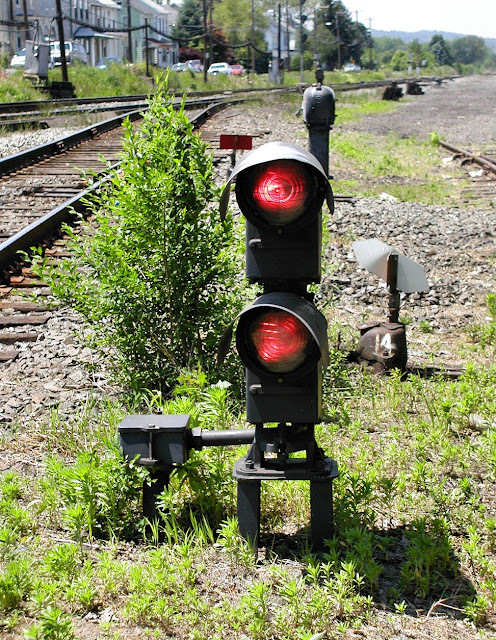 When a signal is displayed a red lamp will illuminate on all switches that are now "locked out". The following post is the first in a 12 part series that appeared first on a British signaling forum as an effort to help teach about North American signaling practices. If there are some odd bits of tone and spelling that is probably the reason. I am still experimenting with the photos and while I want to ensure access to the full resolution images, those that appear on the blog may look smaller due to formatting concerns. Still the full res should be able to be accessed with a right click "view image" or something similar". Please bear with me as I get the hang of this new service. In May 2009 (on National Train Day no less) I took the second of two trips on Amtrak's Pennsylvanian between Philly and Pittsburgh. Like my previous trip I bought a business class ticket so I could have access to the rear railfan window. This time around I had much more sunlight available, better weather and an implied verbal consent to stand in the rear vestibule. As a result I managed to take a picture of EVERY signal between ZOO interlocking and PITT interlocking at MP 342. I also took pictures of other points of interest as well as the trains that we passed and that passed us. If anyone wants to follow along the fully annotated line diagram for this segment can be found at Blockstation.net. If you are interested in browsing the full photo gallery it can be found here. If you wish to view the photos in their full resolution just right click and click on your browser's "View Image" option. We start out with the K section of ZOO interlocking the rebuild of which I covered in a the rebuild of which I might cover in a future post. The K section (called that because it used to be the independent K tower) was once again on its way to being a separate interlocking again. 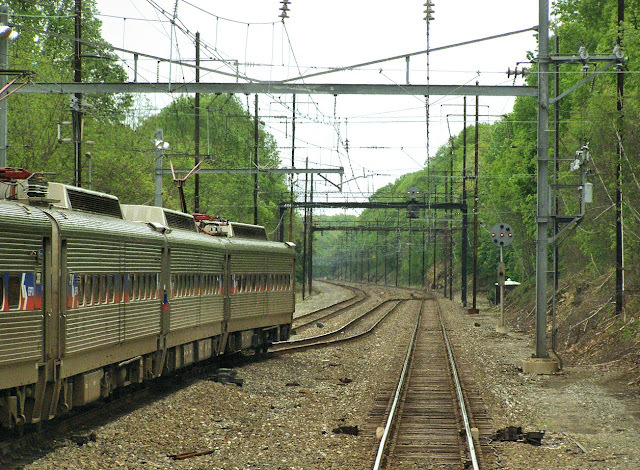 Amtrak had grown tired of maintaining and operating an interlocking that none of its trains used. 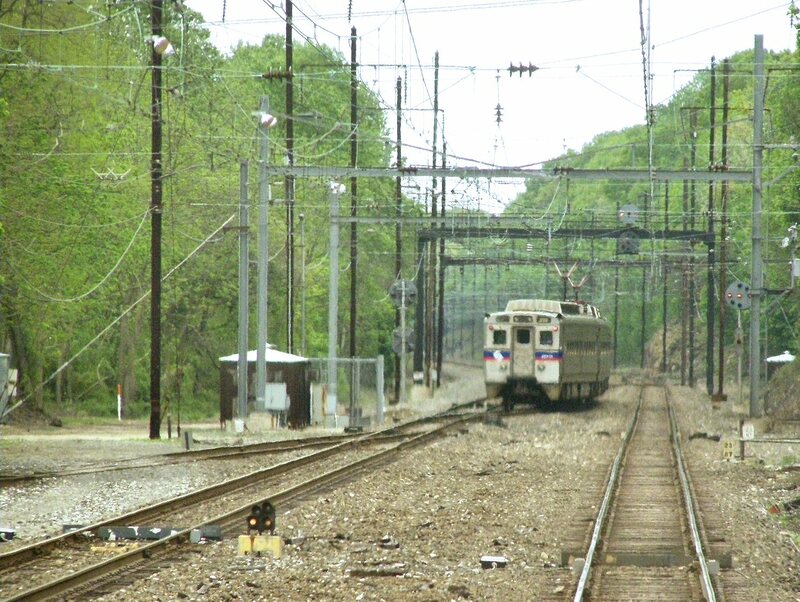 Also, since SEPTA closed BROAD tower there had been communications issues b/t SEPTA dispatchers and the Train Director at ZOO resulting in various misroutes. By transferring K to SEPTA, SEPTA could sort its own trains out as they entered and left Amtrak territory. Before the new interlocking was placed in service last summer the new signals were installed, yet wired into ZOO's huge 230 lever Model 14 machine. 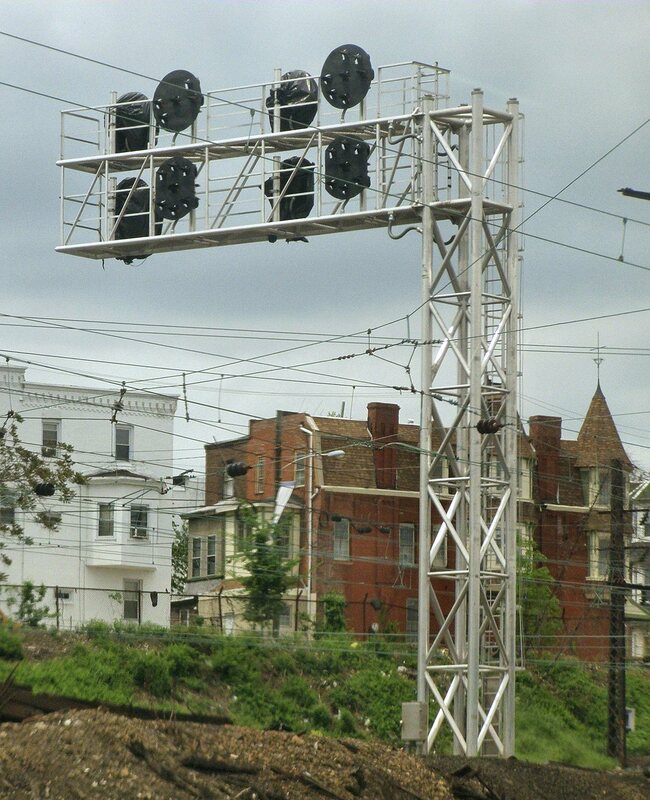 Astonishingly SEPTA chose to install amber PRR position light signals to match what was installed in the rest of ZOO interlocking. Here we have the new 30R and 32R signals on a tubular cantilever mast. Hey, Jersey Mike (aka Sturmovik Dragon) here and I wanted to create this first port explaining the purpose of this new Blog. This is designed as an extension to my existing railroad photo blog over on Live Journal. 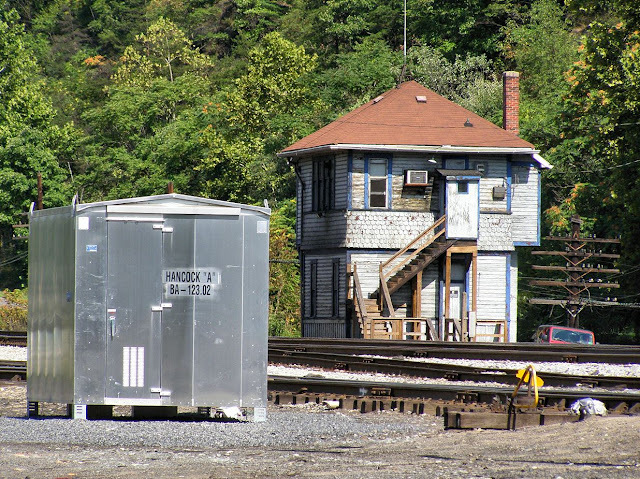 I have been posting on LJ for about 5 years now and what was originally intended as a personal blog designed to share all those Web 1.5 personal tidbits morphed into my primary venue for sharing my railroad related photo essays. I have never been pleased with LJ as an outlet for this creative content as, frankly, LJ, tends not to be viewed as very authoritative or serious so I am using this new forum as a way to help increase my legitimacy and visibility. This will not be a blind mirror of what is located on my old LJ account. Although there will be a great deal of cross posting I will also be posting new content that is more specifically signaling related. Some will be brief news, others will be long format technical essays first posted on a British signaling forum. I also intend to go back into my archives and post update essays of both classic photo sets that I never placed online and my older photo essays that didn't really have a lot of meat to them. Anyway if you are reading this that means you either are heading through the archives or following a link from one of my other blogs or forums. While I may in time change this into my sole outlet for my photo essays, I think the LJ site will continue to serve as the primary home to my general interest essays with re-posting here.